In this post: Best Bulbs for Fall Planting. Five favorites to plant in the fall months for spring and summer blooms. Includes tips and advice from a DIY gardener. 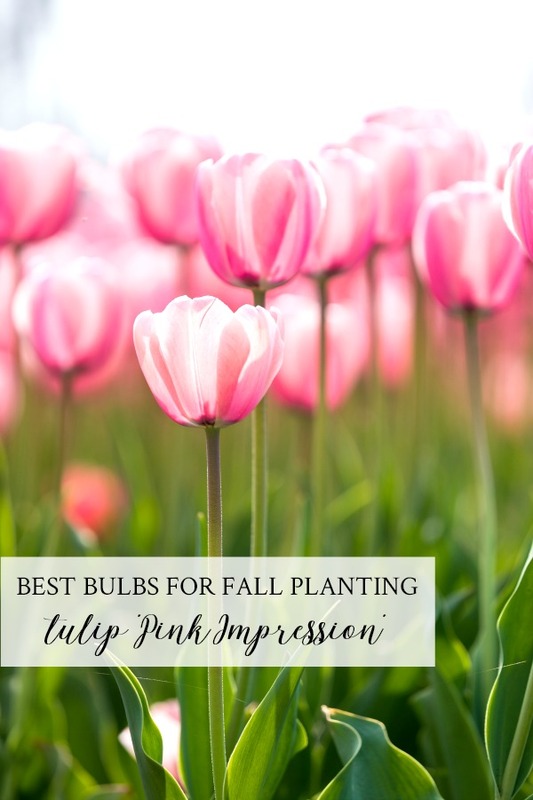 In order to enjoy garden blooms in the spring, you have to do a little work in the fall and plant some bulbs. Even a beginner gardener can do this easy task. All you need is a shovel (or a bulb planter,) flower bulbs, and a lovely autumn afternoon. Here are some tips for planting bulbs in the fall. If you are planting a variety of bulbs, make sure to keep the labels with the bulbs so you know what you are planting. Bulbs vary by size and shape but are very easy to mix up. Take it from someone who got her bulbs mixed up…keep them in order! In zones 1 – 7, plant your bulbs as soon as temps dip to about 50 degrees F at night. That way you know the ground is cool and ready. In zones 8 – 11, bulbs will need to be pre-chilled in a refrigerator for about 6 weeks before planting. You can also purchase pre-chilled bulbs. Plant during the coolest time of year. Plant bulbs in well-drained soil. Most bulbs bloom in early to mid-spring before the leaves appear on the trees. This allows you to plant almost anywhere, even areas that are shaded in summer. Bigger bulbs should be planted about 8 inches deep and smaller bulbs about 5 inches deep. Make sure to set the bulb down into the hole with the pointy side up. Group several bulbs together when planting. This will give your landscape design more depth since the flowers will appear as clusters and make more of a statement. With blooms that resemble daisies, these delicate flowers grow up to six inches tall and don’t require much water. Anemones make great ground cover and will naturalize beautifully in good garden soil. Bulb depth is only about two inches so there isn’t much digging, which is always a good thing! 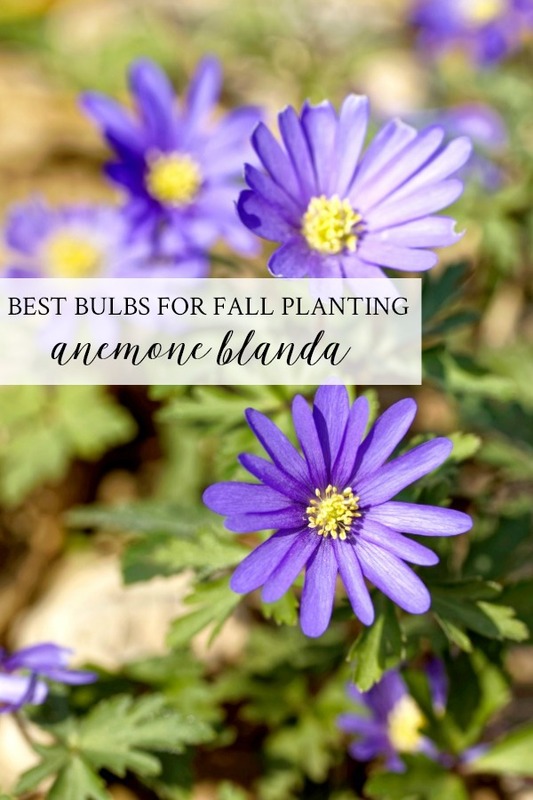 Anemone blanda bulbs producer the loveliest periwinkle blooms with yellow centers and thrive in zones 5 to 10. They are resistant to deer and can take a little shade. 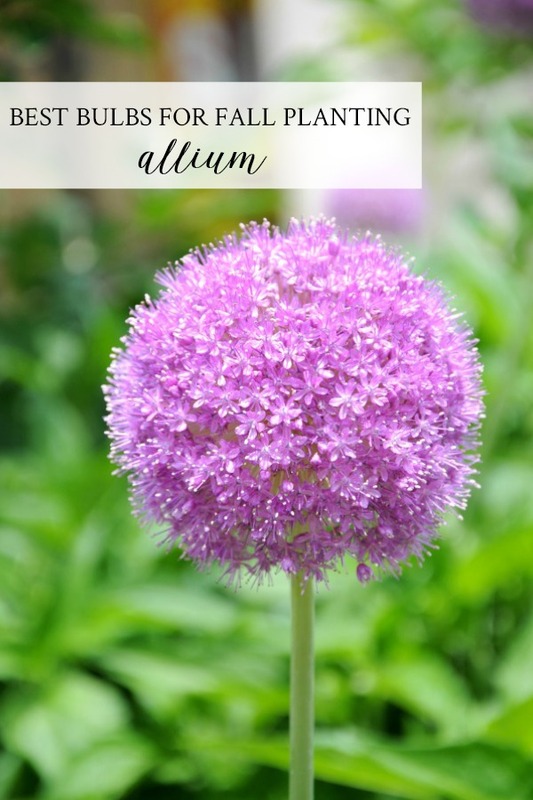 I am obsessed with allium right now. Believe it or not, allium is a member of the same genus that includes garlic, onions and chives. Some varieties grow up to 3 feet tall. The ‘Gladiator’ bloom is a soft pinkish lilac color and spans about five inches wide. Plant both spring and summer varieties for months of color in your garden. If you have a problem with deer, this is the plant for you. They are deer-tolerant, make a lovely cut flower and even attract some birds. My neighbor has the most amazing allium, so I ordered 15 bulbs and just need to find a few minutes to get them in the ground. I’m hoping for some show-stopping blooms next summer. Picking a favorite tulip is not the easiest thing to do. There are SO many to choose from. One of the prettiest ones by far is the Pink Impression Tulip. It was introduced in the late 1970’s so it’s been around for a while. If left uncut, it is a true perennial. However, that’s hard to do because the beautiful, big blooms sit atop strong, tall stems and make lovely cut flowers. This tulip is easy to grow in well-drained soil and blooms in mid-spring. 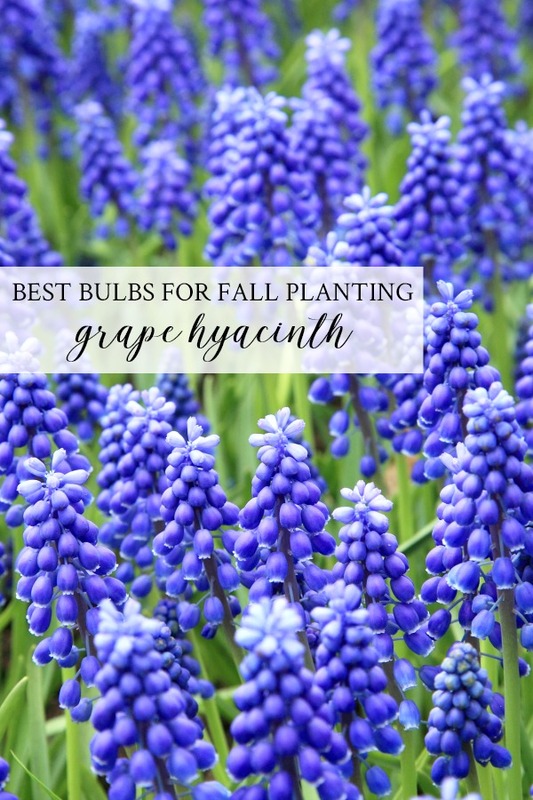 Grape Hyacinths are easy to care for bulbs that multiply and spread easily. They have a lovely scent and bloom in early spring. Growing from 6 to 12 inches tall, they make a great border and are the perfect height to be planted in front of tulips or alliums. Grape hyacinths have been known to show up through an early-spring layer of snow. 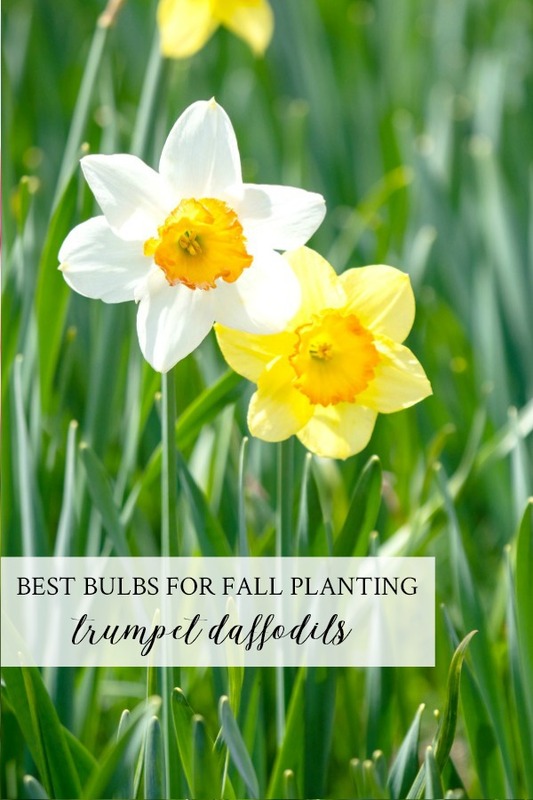 Trumpet or large-cup daffodils are reliable bloomers and multiply each year. One of the reasons they spread so nicely is because deer and rabbits don’t like them. The blooms are left to fade and as they die down, the bulbs are re-energized for the next growing season. The “cup” in the middle, or trumpet, is longer than the actual petal. This show-stopping flower has one bloom per stem. I would love to plant bulbs, never done it before, but what do you do with them once the flowers are no longer blooming? Do you dig them up? It depends on the bulb. After the blooms are spent, it’s important to let all the leaves and stems die down because this regenerates the bulbs. Most bulbs actually multiply and bloom for many years. It is still so hot here in SW Georgia that I haven’t even thought about bulbs! However, now that you have reminded me that it is that time of year, I will get some more tulips and add to my flower bed. We have critters too that would dig them up but the stray dog that showed up is patrolling nicely to keep down on the little pests. Guess he feels he needs to earn his keep!! Thanks for the refreshing post! I would love to have all these beautiful flowers, in my yard,but we have so many deer and squirrels here that love them too ! You have to plant in pots and keep them in a screened in area.Who would think this would be such a problem in Florida ! Happy planting to you Ann. These spring flowers are so beautiful! Thank you for your tip on planting them. I live in Northern California and have to put the bulbs in the fridge for a bit before I plant them. I love the Windfowers..they are a delicate looking flower…so pretty..just to bad they bloom for a short time. Alas! Every time I plant bulbs, out come the rabbits and squirrels and they dig up almost all of them. So I have to pass on these but I do love planting bulbs. I hear you…I have squirrels too. I am just hoping for the best! I love snow drops – they will poke their heads up through the snow as early as February here on Long Island, NY. I’ve also have great success with species crocus. They come in shades of purple to soft lilac. They bloom sequentially with the lighter ones early and the darker ones a few weeks later. The species crocus spread by seed! I just love my early harbingers of Spring- they never fail to make me smile! Happy planting Ann! 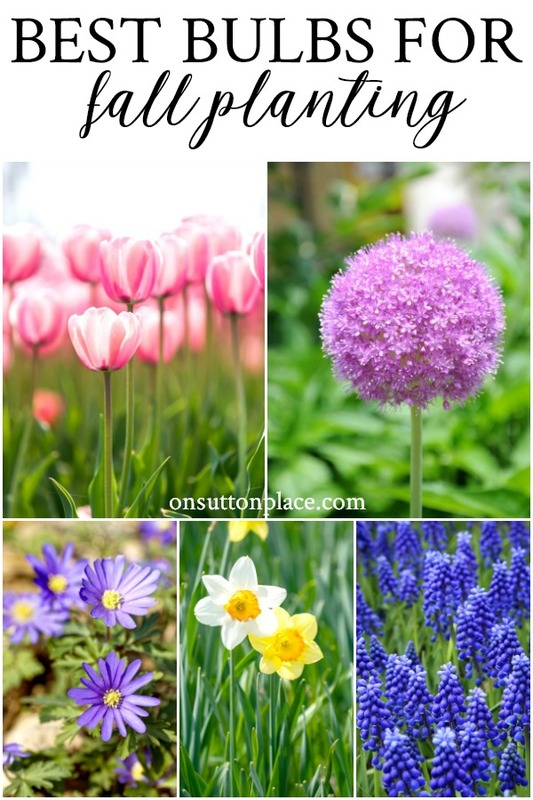 Thank you so much for these suggestions, I love planting bulbs but am sometimes disappointed when they come up and aren’t what I expected, so I love having specific names of cultivars to go looking for! I’d love to see where you are planting these beautiful bulbs. Do you amend your soil with anything before planting? They are going in my fence row garden in my back yard. You can see it here: https://www.onsuttonplace.com/backyard-garden-landscaping-ideas/. I don’t actually amend the soil, but when I dig up the soil to plant, I refill the holes with fresh fertilized garden soil. I hope this helps!